how to create a graph with stratified x axis (like variability) but stacked colums? I would like to create a graph with this characteristics: multiple x axis value (let's say day-week-month-year) but displaying stacked bars. Is it possibile? I wandered through index and manuals, but I found possibile this kind of axis for variability only, which accept Y data only as point and no multiple series of data. on the other hand the chart is the only graph I found that displays stacked bars, but no way of maipulating the x axis ... there is a way to combine both? maybe it is simple and I didn't look at the obvious, in this case please address me! Re: how to create a graph with stratified x axis (like variability) but stacked colums? You can do it Graph Builder in JMP 10. Drag multiple categorical variables into the X axis to nest them. 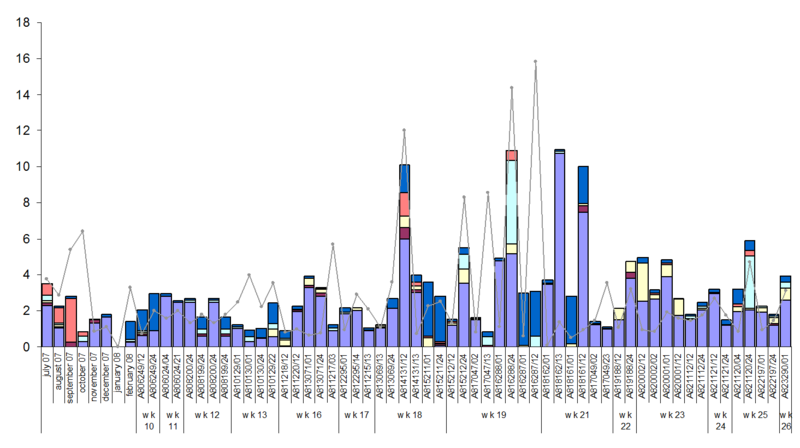 I have seen that graph builder is much better in JMP 10 and I'm glad to see that it could help with my issue, but unfortunately I am on JMP9 and will be for a couple of months at least. Do you know if there a workaround for that in JMP9, better if it's scriptable? I already do value ordering for the primary X axis value (let's call it "day"). So the JMP9 workaround should be to create another column like "month"||"week"||"day" and to use that as axis? I tried but it is a bit too graphically heavy, I think I'll wait for JMP10, thanks for your help. ok, after other activities I turned back briefly on this issue (more for curiosity than for real necessity) aaand ... again no good. the graph builder correctly accept my data and nest them if I use few lines (50? 100? ), but if I toss in several hundred lines, it collapses the X axis leaving only the lowest categorical variable and in the label says "week & 2 more". I don't want a median on week! I can do it with the standard chart graph! I want to see on the X axis all the three variables, like on a variability ... is there a switch somewhere or a parameter in jsl to not collapse them?